This disc is an out-and-out winner. Moreover, it’s an excellent example of what the recording industry can do at its best. 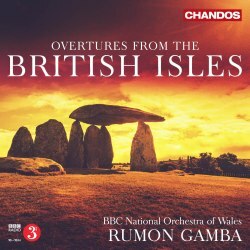 Rumon Gamba and Chandos have put together a programme of largely-forgotten British overtures which, as these performances show, do not deserve to be forgotten. The programme once assembled, it has been performed with zest and great accomplishment by Gamba and the BBC NOW. Chandos has recorded the performances in splendid, full-blooded and detailed sound and then issued them with thorough documentation, including informative notes by Lewis Foreman and a nice little essay by the conductor. The only tiny criticism is that it’s a mild frustration that Mr Foreman’s notes about each piece aren’t laid out in the order in which they’re played. If that’s the only criticism - and it is - then it must be a fine disc. I attended a full performance of Coleridge-Taylor’s The Song of Hiawatha at the 2013 Three Choirs Festival (review) so I was interested to hear the overture. Lewis Foreman says in his notes that the overture is a separate work, rarely heard as the preface to the complete trilogy. In that respect it reminds me of the relationship between Dyson’s overture, At the Tabard Inn and The Canterbury Pilgrims. The similarity falls down, however, when one considers the musical material for Dyson’s overture is based on themes from the choral work whereas, as Mr Foreman points out, Coleridge-Taylor makes virtually no thematic reference to his cantatas. Instead the main thematic material is the spiritual ‘Nobody knows the trouble I see’, which is heard early on from the violins (1:12). The overture is a thoroughly engaging piece. More serious in countenance is Stanford’s Prelude to Oedipus tyrannus. This derives from incidental music for a theatrical production of Sophocles’ play in Cambridge. Was this, I wonder, one of the annual productions of Greek plays at the university that a few years later prompted Vaughan Williams’ The Wasps? Lewis Foreman tells us that Stanford’s Prelude brings together various elements from the incidental music. These include a noble string melody, heard twice, and a haunting cor anglais theme which is also given a second airing. It’s an impressive piece. Also quite dramatic at times is Sullivan’s Overture to Macbeth, composed as part of the incidental music for a production by Sir Henry Irving of Shakespeare’s play. Austin’s The Sea Venturers is a splendid opener to this programme. The music in the outer sections is sometimes turbulent, always lively, while the calmer central section includes a delightful singing tune which has a very English accent. It’s a very colourful, attractive piece in the course of which swashes are buckled at times. The remaining pieces are lighter in tone. Cowen’s The Butterfly's Ball is bubbling and vivacious; it’s also delightfully scored. Once a Proms favourite, it has fallen into complete neglect since the composer’s death. I fear that the title alone has probably worked against it in the more “hard-headed” times since the 1930s but that’s a great pity for this is a piece full of innocent enjoyment. It’s a charming example of lighter British music at its best. The Bantock overture is colourful and good humoured. This spirited piece is given a performance to match. Mackenzie’s overture was part of his incidental music to a pre-Peter Pan play by J.M. Barrie, to whom the piece is dedicated. The thoroughness of Chandos’ documentation even extends to naming the dedicatees of pieces. The play depicts, rather innocently, I should imagine, life in a Scottish village and the music is shot through with ‘Scottishness’. Balfour Gardiner’s overture is frolicsome and entertaining. Lewis Foreman says that Gardiner was so self-critical that he was prone to destroying many of his scores after their first performances. I’m glad this one escaped his self-destructive tendency. Has this disc unearthed any neglected masterpieces? No. Does it contain enjoyable, well-crafted pieces that deserve to be better known? Emphatically, yes. This disc is a delight from start to finish, both in terms of the music and the performances. We know that the BBC NOW is an accomplished orchestra; there’s not just accomplishment in evidence here but also a palpable sense that they’re having a thoroughly good time. Rumon Gamba conducts sparkling performances. In his engaging note in the booklet Gamba says that he and Chandos compiled a very long list of candidate works for this disc and then whittled the list down significantly. He more than drops a hint that he’d be open to the idea of a Volume 2. Yes please. This is a tangy slice cut deep, variegated and generous through the British repertoire of concert overtures. Austin’s The Sea Venturers is dedicated to the choral conductor Charles Kennedy Scott. It is a wave-racked and salt-spattered piece. It has a foot in various camps: Bax (Tintagel, Overture to Adventure), Delius (4.47) and Vaughan Williams (Dives and Lazarus). At 3.15 it boasts a fine Baxian lyric theme of high quality. This diverting piece was recorded before on RLPO Live, ClassicO and Dutton. Stanford’s Prelude to Oedipus tyrannus is impressively concentrated with smooth, curvaceously romantic invention (1:29) subtly put across and ending with gravitas and understated confidence. We last heard this piece on the very same label as part of the Handley-Ulster-Stanford series (CHAN8884). The Coleridge-Taylor overture to the choral triptych is a gracious, smoothly contoured and sometimes exciting piece that bring Dvořák and even Verdi to mind at times. Not up to the standard of the Violin Concerto but well worth hearing. It has been recorded before on Naxos/Marco Polo. Cowen’s The Butterfly’s Ball has a lacy-delicate, Palm Court-salon feel and some tempestuous Tchaikovskian moments. Adrian Leaper recorded this Marco Polo in the late 1980s. Dutton have also issued a transcription of the composer’s own acoustic process ‘78 version from 1916. The music is dedicated “to Robert Newman's Queen's Hall Orchestra”. Next in line is Bantock’s flighty Comedy Overture The Frogs from a year later than the Austin work. It is dedicated to the conductor Werner Janssen. This is a lightish confection - sumptuous in a Straussian way and somewhat ornate, as was Bantock’s way in works such as Pierrot of the Minute. This was recorded in the orchestral version on a Paxton ‘78 in the 1940s. The brass band version has been recorded several times - recently by Doyen. It is very good to have this in such good digital sound. Mackenzie’s Overture to The Little Minister (J.M. Barrie) put in a welcome appearance on a Gough and Davy LP (GD2003). There it was played by the admirable City of Hull Youth Symphony Orchestra conducted by the wonderful Geoffrey Heald-Smith. That was back in the late 1970s. This piece of fluffy Caledonian tartan has its delicate moments alongside all that jauntiness. It might just as easily have been by Stanford in his Celtic mode. The Macbeth Overture is from Sullivan’s 1888 incidental music. It’s a substantial piece. Not desperately craggy or sinister its pages might have come from Smetana or Dvořák. Still, as a companion to works such as Richard III or Othello it’s a diverting piece. It can also be found on Hyperion’s Victorian Concert Overtures CD. Balfour Gardiner’s Overture to a Comedy is one of his small clutch of scores. It has been recorded before by Richard Hickox for EMI Classics (CDC 7 49933 2). There is a very early Argo LP of this work where the LSO is conducted by Richard Austin. Gamba gives this a neatly uproarious spin. It’s charming light music, rather like the same composer’s Shepherd Fennel’s Dance. Balfour Gardiner wrote a symphony (reputedly lost … but is it?) as well as some highly attractive and almost impressionistic lush works such as Philomela, April and the Berkshire Idyll. He merits a full disc of his own. If you would like to know more about him then go straight to Stephen Lloyd’s fascinating biography. Intriguingly this overture was dedicated to York Bowen. Each of these overtures has been recorded before but none of them are at all commonly encountered. This typically polished, well documented and inspired disc make a good complement to the Lyrita overture anthology: Premieres and Encores SRCD318 not to mention the sparkling nineteenth century Somm collection and Hyperion’s Victorian Concert Overtures. Rumon Gamba has a gift for this sort of music. He is under-used and under-estimated. It would be good to hear him in a major Chandos series … or three beyond the confines of light music and film scores. I know Chandos currently have Neeme Järvi doing the Atterberg symphonies - and with really good results. However Gamba would be excellent in that sort of repertoire. How about kicking over the traces again and using him for Gösta Nystroem’s staggeringly beautiful Sinfonia del Mare, Joseph Marx’s voluptuous Eine Herbstsymphonie or Hilding Rosenberg’s Symphony No. 4? Back to more practical realms, then. If you are in the market for a generously proportioned and generous-hearted set of fairly out of the way, fresh-faced British concert overtures you need look no further.